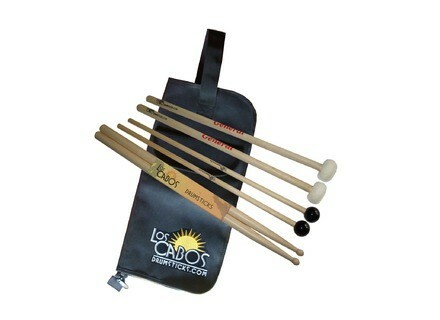 Student Percussion Pack, Other Drum/Percussion Accessory from Los Cabos. 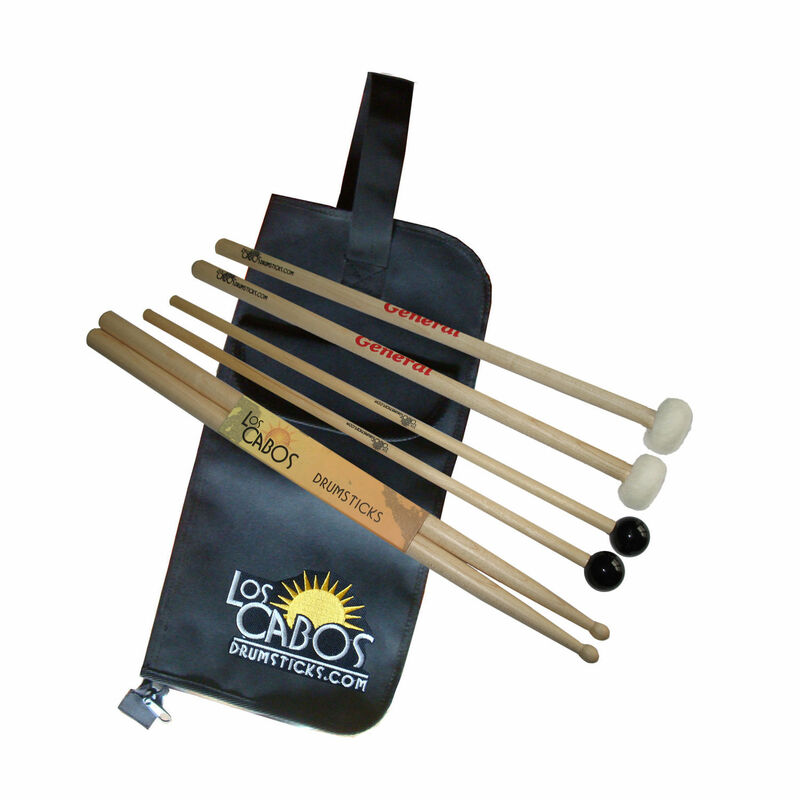 For the drums and percussion student in your family, Los Cabos Drumsticks introduced the new percussion pack. It consists of one pair of "General" Tympani mallets, one pair of bell mallets, and one pair of Concert drumsticks, this pack is perfect for both the aspiring drummer and percussionist in the school band program, as well as the professional. The Tympani mallets consist of a Canadian Maple handle and a medium — hard felt beater. At 15.75 inches in length, they offer good balance and sizing for all ages including adults, according to Los Cabos. The Bell mallets feature a 16 inch handle with a 1 inch Phenolic (hard plastic/resin) ball to bring out the bright tones. The Concert series drumsticks are made from Canadian Maple and are 16 3/8 inches in length. The whole package comes in a black, zippered stick bag with the Los Cabos logo displayed on the outside. It is priced at $52.00. For more information, check tout www.loscabosdrumsticks.com. Taye Hardware Pack Z These stands feature a holographic swirl type finish. New Metropolitan Finishes Metropolitan Cocktail Drums has announced the addition of over 30 wood finishes. On-Stage Sticks DA-100 The DA-100 is presented as "the solution for drummers who can't afford to miss a beat because of a dropped or broken stick."